이 작품은 전통판소리 다섯마당 중 하나인 ‘심청가’가 여성을 재현하는 방식을 분석하면서 한국전통서사들이 가진 몇몇 전형적인 재현을 비틀어 다시 쓴다. 심청가는 주인공 심청이 소경 아버지의 눈을 뜨게 할 재물을 마련하기 위해 중국 상인들에게 제수로 팔려 몸을 던지러 가는 ‘효심’에 관한 이야기로 잘 알려져 있다. 심청가에 따르면, 심청은 ‘소상팔경(瀟湘八景, Eight Views of Xiao Xiang)’을 유람하면서 죽음의 장소에 다다른다. 이 대목에서 죽음을 목전에 둔 심청 앞에 소상강에 몸을 던졌던 중국의 충신과 열녀의 유령들이 나타나 너도나도 심청을 불러 그 효심을 치하하게 된다. ‘소상팔경’은 중국 호남성(Hunan, 湖南省)에 위치한 동정호(Dongting Lake, 洞庭湖)와 남쪽 영릉 부근으로 ‘소강’과 ‘상강’이 합쳐지는 근방의 여덟 경관을 이른다. 이 소상팔경을 그린 ‘소상팔경도’는10세기경 중국에서 발생하여 한국과 일본으로 유입되었으며, 조선시대 이후에는 완전히 한국적 맥락에서 자주 산수화의 주제가 되었다. 소상팔경은 실제하는 장소임에도, 한국과 일본 같은 동아시아의 한자문화권 안에서 자주 그 소재가 시/화에 이용되면서 가장 이상적인 관념의 풍경으로 해석되어 왔다. 심청전에 등장하는 소상팔경 또한, ‘효심’을 증명하기 위한 이 가혹한 죽음을 유교적으로 매우 의미있고 귀한 죽음으로 재현하기를 종용하는 ‘이상적’ 죽음의 장소에 다름아니다. 이 작품은 심청이라는 한 여성에게 닥친 관습화된 전통적 윤리의식과 이상적 관념의 폭력을 문제화하는 한편, 이른바 ‘문인산수 /관념산수’ 전통의 모범적 소재인 ‘소상팔경’을 모티브로, 젠더와 그 재현, 동아시아 전통미학과 그 인식론들의 틈새를 벌리고자 한다. Analyzing the ways in which women are represented in the Song of Sim Cheong, which is one of the five madang (cycles) of the traditional pansori (story-singing) of Korea, this work subverts and rewrites several typical representations of womanhood in traditional Korean narratives. The Song of Sim Cheong is well known to Koreans as a tale of filial piety where the eponymous heroine sells herself to Chinese merchants as an offering to the rough seas in return for three hundred sacks of rice for Buddhist services, which will miraculously give eyesight to her blind, old, widowed, and impoverished father. According to this work, the protagonist reaches the location of her prospective death while sightseeing the Eight Views of Xiaoxiang. At this point, as Sim Cheong thus faces her own impending death, the ghosts of loyal officials and virtuous women in Chinese history who threw themselves into the Xiao River and the Xiang River to preserve their political and moral integrity appear before her, calling the heroine and praising her filial piety. The Eight Views of Xiaoxiang refer to the eight scenic spots around the junction of the Xiao River and the Xiang River in Hunan Province, China, near Dongting Lake and Lingling to the south. Paintings of these eight scenes developed in China around the 10th century and were subsequently introduced into Korea and Japan as well. In Korea, the views became frequent motifs of landscape paintings in a completely native context starting in the Joseon Dynasty (1392-1910). 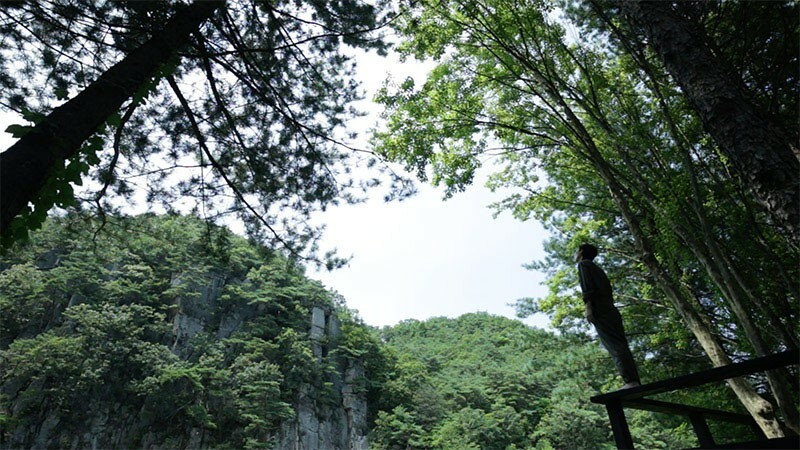 Even though they are actual locations, these eight scenic spots came to be used often as motifs in poetry and painting in the Sinitic cultural sphere in East Asia including Korea and Japan, thus being interpreted as scenes of the most ideal concepts. Indeed, as they appear in the Tale of Sim Cheong, the Eight Views of Xiaoxiang likewise are none other than sites of “ideal” death that urge one to represent the heroine’s impending and cruel death, intended to prove her filial piety, as a death that is very significant and valuable in terms of Confucianism. While problematizing the violence of both conventionalized and traditional ethical codes and ideal concepts that befalls a woman named Sim Cheong, This piece also seeks to widen the gap between gender and its representation on the one hand and traditional East Asian aesthetics and its epistemologies on the other hand, with the motif of the Eight Views of Xiaoxiang, which are an exemplary theme of the so-called “literati landscape painting”/“conceptual landscape painting” tradition in the region. 동녀(童女)를 실었으니 진 시황(秦 始皇)의 채약(採藥)밴가? 방사(方士)는 없었으나 한 무제(漢 武齊)의 구선(求仙)밴가? How many nights have been the nights of the ship, and how many days have been the days of water? Would Song Yu’s “Ode of a Melancholy Autumn” be sadder than this? For a young girl is aboard, is this Qin emperor Shihuang’s ship to find the plant of eternal youth? Though there is no master of esoterica, is this Han emperor Wu’s ship to find the elixir of life? Into the boundless sea, like a seagull, After rising, And splash! Falls. 이 물에다 넣고 가니, 후사(後事)가 어이 좋을 리가 있겠느냐? 홍료 월색(紅蓼 月色)이 어느 곳고? 일강 세우 노평생(一江 細雨 鷺平生)에 너는 어이 한가(閑暇)허느냐? And put them in these waters and leave, how could the aftermath be good? Where be the moonlight on the red water pepper? Living like an egret on a river with a drizzle over it, how be you at leisure? How could I go, treading the path to the otherworld?